THIS TRIP IS CURRENTLY FULL – Click below to place your name on the Wait List. Celebrate the season with a collection of amazing holiday shows and attractions! We’ll begin at the Rosewood Entertainment Center in Delavan for “Christmas Remembered”. This show features songs, hymns, and carols that make this a magical time. Sing along to your favorite holiday classics like Sleigh Ride, Silver Bells, Little Drummer Boy, White Christmas, Silent Night, Jingle Bell Rock and more. A fun and tasty Jelly Belly Factory Tram Tour is sure to be a favorite. The remarkable Christmas with the Dancing Horses will be unbelievable and will leave you speechless. At dusk we’ll enjoy a unique Lake Geneva Santa Cruise aboard an enclosed and heated boat that provides extraordinary views of lighted shoreline Christmas displays. 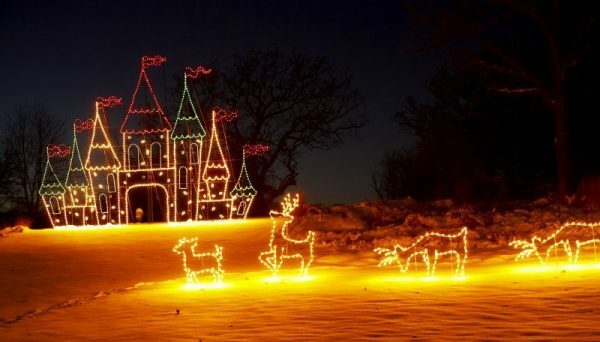 We’ll also take a drive through the fabulous Grand Geneva Resort Holiday Lights Display. Finally, we’ll take in the Fireside Dinner Theater’s “Elf The Musical”. Based on the beloved holiday film, this hilarious comedy has become a modern day classic. All breakfasts, all evening meals & two lunches are included. Motor coach transportation. Minimal walking.